I wish you all a fun and relaxing long weekend. I hope you have the chance to spend it with family and loved ones. Weather-wise, it looks like it's going to be a beautiful weekend. Enjoy it! Spring is finally here! "Hi Fabio: I live on the 1200 block of Dot Avenue and we have been having someone trying to break into the cars sometime after midnight. Please let people know to lock their cars – we have had a few lose money and valuables over the last few weeks. Thanks"
"No I haven’t called the police and I don’t know if anyone on the street has. I always keep my car locked but the other night when we had snow there were foot prints around the car." The resident intends to notify the police so they are aware. Please be on the lookout and always contact the authorities. The more information you can share and bring attention to, the better. Rose City Clean Sweep in the West-End! Our West End is participating in the Rose City Clean Sweep! Date and location(s) of OWE Community Clean Sweep will be decided at this meeting. 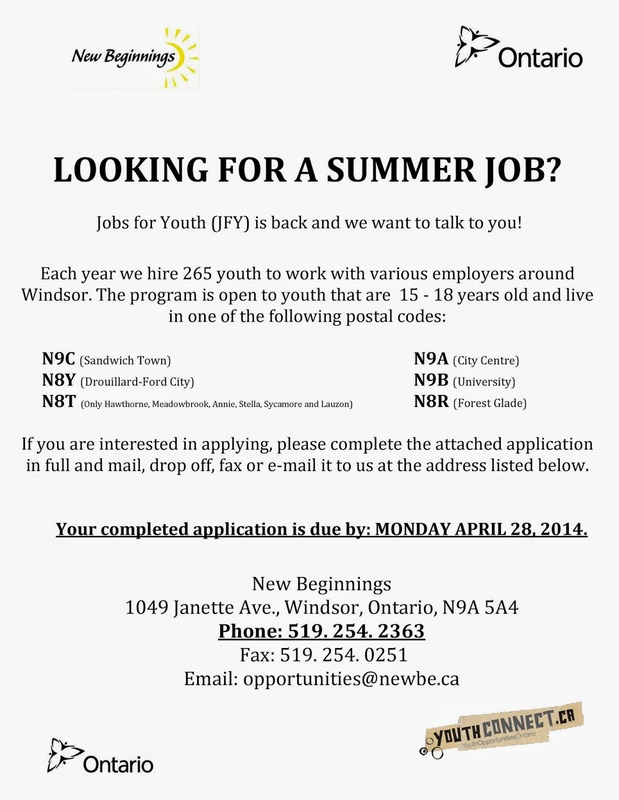 I received an email from New Beginnings, an incredible organization that works with youth in the west-end and other neighbourhoods in Windsor. They have a summer jobs program for youth and asked if I could promote it to the west-end community. I included three copies, one for youth interested in applying, one for employers interested in hiring and the last for those interested in nominating a youth. There is much more info I can provide. If you are interested in learning more, please email me and I will send you the packages I received or just contact New Beginnings directly at the contact info provided below. Please see an email I received from Donna Cowie, a volunteer for seniors in Windsor and one of the organizers of this book event. I met Donna recently at a United Way event and promised her I would promote the book sale so families in the west-end are aware. Please check it out and grab some books for you and your kids! "The Raise a Reader Book Used Book Sale takes place this weekend at Windsor Crossings. There will be lots of signs at Crossings to direct you to the store. We have paperbacks for one dollar and hard cover books for three dollars. All children’s books are twenty-five cents. The sale starts on Saturday, April 12 at 9 a.m. until 6 p.m. and the sale continues on Sunday from noon to five p.m. We will also have a final sale on Saturday April 19 from 9 - 6. Official Closing Ceremony: Friday, May 30th on the Front Lawn at 10:00 a.m.
Celebration Open House: Saturday, May 31st 10:00 a.m. - 6:00 p.m. Free admission. Forster will be open to the public and alumni one last time. Visit decade rooms, unofficial closing ceremony in auditorium at 1:00 p.m., current and former staff reception in auditorium 5:00 - 6:00 p.m. Meet up with old friends after the Open House at many Sandwich Towne establishments. On April 4th and 5th, from 8:30am to 4:30pm at the St. Denis Centre (255 College Ave.), there will be a robotics competition that will showcase all of the robots built by our high school students, including Assumption high school. The event is free and open to the public. No tickets are required. 39 teams from around the Great Lakes Region. My name is Paige Slingerland and I'm participating in the MS bike tour on July 26th and July 27th. This is a bike ride that goes from Grand Bend to London and back over two days. A distancing totalling roughly 150km. All the pledges and donations that I receive through my fundraising efforts will go to the Multiple Sclerosis society. The good people at St. John's grade school (where I attended many years ago) are hosting a fundraiser this Sunday. Here are the details along with a link to their facebook page. I hope you can make it and support the St. John Parent Council group. "Come and support the St. John School Parent Council. Tickets are $7.00 per person. With each ticket sold $4.00 goes to the school. The breakfast includes 3 generous size pancakes, bacon and a beverage."